In this book, Charles Dowding shares the wealth of his experience, explaining his approach to soil and plants and revealing the range of techniques that have enabled him to grow healthy and vibrant crops for decades. His success is based on a key principle of “no dig”—not digging. This enhances soil structure and encourages healthy growth, especially when soil life is encouraged and multiplied through the addition of good compost and manure. Based on this approach and his use of a system of permanent, slightly raised beds, Dowding shows, in this book, how to grow a delicious variety of fruit and vegetables: what to choose; when to sow, plant, and harvest; and how best to avoid pests and diseases. enabled him to grow healthy and vibrant crops over the years. One of our most respected vegetable growers ... Now ordinary gardeners can benefit from his years of practical experience." Charles is a passionate and accomplished gardener, who grows vegetables of amazing flavour. Charles Dowding has written many books on vegetable growing and contributes regularly to many magazines, including Permaculture, Gardeners’ World, Gardens Illustrated & Grow It!. 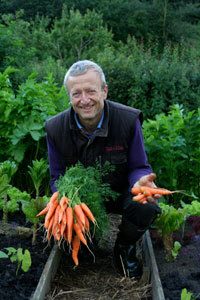 He gives regular talks, advising gardeners on best practice and runs courses on organic, no-dig gardening. He is a regular guest on radio and TV. A veteran organic grower, he has practised no-dig gardening for years, providing produce for local and London markets, running a small farm in France, then producing salad on surface-composted, undisturbed clay soil, which grew bountiful crops and few weeds. He has run experiments to compare differences in growth between vegetables on dug and undug soil, discovering different patterns of growth in most seasons, with slightly lower yields and more weeds and slugs on the dug beds.